Ultimate Art are holding a small exhibition of art by the Utopian Community covering the famous Petyarre and Pwerle families. Utopia is an Aboriginal homeland formed in November 1978 by the amalgamation of the former Utopia pastoral lease with a tract of unalienated land to its north. It covers an area of 3,500 square kilometres, transected by the Sandover River, and lies on a traditional boundary of the Alyawarra and Anmatjirra people, the two language groups which predominate there today. The name is probably a corruption of Uturupa, which means ‘big sand hill’, a region in the north west extremity of the area.. It has a number of unique elements. It is one of a minority of communities created by autonomous activism in the early phase of the land rights movement. It was neither a former mission, nor a government settlement, but was successfully claimed by indigenous people who had never been fully dispossessed. Its people have expressly repudiated any municipal establishment, and instead live in a score of outstations or clan sites, each with a traditional claim to the place. 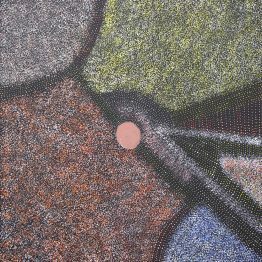 It was in the late 1980’s that Aboriginal people of Utopia started to put acrylic paint on canvas. 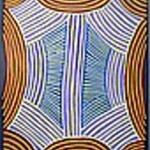 This followed a very successful decade of working with batik, several years after the Papunya art movement began which put Utopia on the map, so to speak. The women had been rounded up to try their hand at batik, which they fell in love with (Lindsay Bird was the only male artist to participate). When painting eventually reached the people of Utopia, with its quick drying and no mess properties batik was a thing of the past. Generally Utopia artists were initially quite formal in their painting techniques. So, most work was done with the use of fairly large dot or linear work. The forms from which the acrylic paintings take their inspiration include: ground designs, rock paintings, ceremonial and body paintings, along with flora and fauna. It was quite traditional in depiction so much that the symbols or style clearly showed a cultural story whether in regard to ancestral Dreamings or Bush Tucker. It didn’t take long before many artists became bolder in style, colour and flair. This is what the art of Utopia is renowned for today. 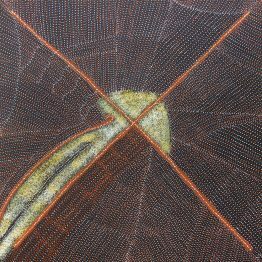 Utopia women in particular are known as the leaders in female aboriginal art as well as their colourful contemporary appeal. 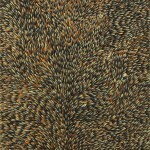 This has resulted in a deeper and broader interest in aboriginal art throughout Australia and internationally. A number of individual artists started producing art that was so different to the normal. The unique colour sense, creativity and genius caught everyone by surprise. This is how Utopia art emerged. So too had artists such as Emily Kame Kngwarreye, Gloria Petyarre, Kathleen Petyarre and Ada Bird. This art continued to change with the introduction of more colour, more storylines, and more abstract work, but it always has an underlying cultural meaning. Other artists such as Barbara Weir, Greeny Purvis, Nancy Kunoth, Angelina Pwerle, and Violet Petyarre began to be noticed and joined the others as household names.